A Thing for Roses: I Been a Lazy Girl So How about a Random Giveaway?! I Been a Lazy Girl So How about a Random Giveaway?! I don't really know what has gotten into me lately. I can't seem to get very motivated to do much these days. Maybe I need some vitamins or something. This week's thrifting adventures turned up very little. Not even enough to warrant a group photo. My hubby asked me if I was going to JoAnn's one day as he needed some brown felt for a project. I was going to go right by JA's on my way to the thrift store so of course I could stop. 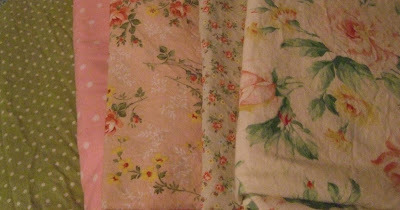 So glad I did as they were having a sale on some purty fabric. So, $40 plus later here is what I ended up with. I'm thinking these will make some lovely shopping cart liners. Even though I figured out that I sold 12 shopping carts this summer at various shows, I have at least that many carts left and with me, it's never too early to be thinking about the next show I will be doing which is Farm Chicks (next June) as I am the queen of procrastination. Our Vintage Sale last week went well despite the city removing some of our signs from the Highway. It was so fun to see so much of my stuff go bye bye and even more fun taking a load of stuff to Goodwill on Monday. Funny thing though. Isabel went to the Goodwill Outlet in Portland on Wednesday and spotted a piece of ugly fabric I had donated. She knew it was mine as it still had its garage sale tag on it. I did manage to make a trip to Monticello with a load of stuff. Again, forgot to take some pictures. Our booths are full to overflowing with good stuff so if you are in the area, stop in and take a peak. Our special booth will be set up in the Garden Room until October 13th. Not sure where I'll put everything after that as I'm sure it won't all fit in my regular space. Oh well, I'll just worry about that later. In case you're wondering what I did this week while I was being lazy. I reserved a bunch of movies from the library and watched most of them. Have I ever mentioned how much I love my library? I do. It's great! They have lots of dvds and if they don't have what I'm looking for, I can just reserve it online from another location and they will ship it to my library. So fun! Isabel and I also met up to go see this movie. It was pretty good. Not the best movie ever, but a fun Chick Flick. It's now Saturday morning and for once I have absolutely nothing planned for the weekend. I think this will be an excellent time to tackle a few projects I have been procrastinating. Remember these chairs? This weekend they will be painted and recovered. Okay, now that I have said that, I am committed to doing it. You will hold me to it, right? Also, I have special plans for a dress form that I took apart and another project I have been thinking about that will use up some of my barkcloth scraps. So stay tuned! 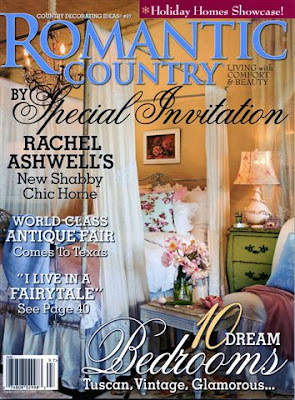 Recently I read on a couple blogs that the newest issue of Romantic Country was finally out. I just love this magazine and wish it wasn't a quarterly, but a monthly publication. I had to go to 5 stores to find it. Since it was so difficult for me to find, I thought I would buy an extra copy and give it away on my blog. And since I love to do lavish giveaways, I'll include some extras as well. Oh, you know, maybe some vintage wallpaper, pretty buttons, etc. So, if this sounds like your cup of tea, just leave a comment on this post. I will pick a winner on Monday morning. Well, I hope you all have a wonderful Fall weekend. Get lots done or nothing at all! Be back on Monday. I have trouble finding that magazine too! So please count me in. Can't wait to see what you do with the chairs. Love your blog, please enter me!! Vintage wallpaper, buttons AND Romantic Country - boy did my ears perk up! Count me in please. 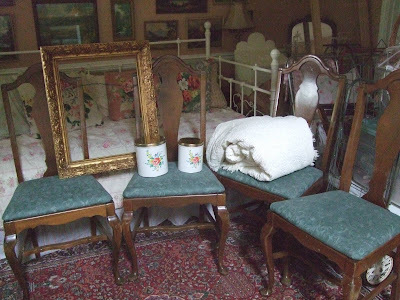 I enjoy reading your blog, and I'm reminded of the years I had an antique booth. Nice that you have a friend that shares that passion too. I've been feeling lazy too, but did manage to plant yellow mums yesterday, and mulch them today. OK, now I can reward myself with some blog surfing. Oh yea! I would love that magazine! I can't wait to see pictures of your finished projects. Your blog is such an inspiration to me. I dream of being able to do what you do. I have a hard time finding that magazine where I live also...and I don't know ANYONE who decorates with that style...hmmmmm. I can't wait to see the chairs and what you do to them. Have a great LAZY weekend!!! oh ya, love it! Read your blog almost everyday. You and all the other bloggers have inspired me to create my own. Still in progress though. The cart fabrics you chose are so pretty! Please enter me in your giveaway. I am having a giveaway too,socme on over and check it out. It is for my 100th Blog Post. Yay! Looks like you have a busy weekend planned with all of these projects. I don't think I have ever run across Romantic Country in my area, of course I don't go to bookstores which is most like where I would find it. I love to get movies from the library. I didn't know you could request from other locations. HMM, will have to give that a shot. Hi! I check your blog everyday and would love to be entered into your drawing! Love that magazine and so does my mom! Good luck with the chairs you will redo. Can't wait to see the finished product! Lisa, long time no hear! (o: I missed not reading your blog. It sounds like you had a very enjoyable week watching movies though. I'm glad your sale went so well last week-end. It's always good to get rid of the old so you can make room for more! Oh i would love a copy of romantic country,being in the UK i don't get to see it often. Please include me in the giveaway. I would be thrilled to win this magazine! We live in a small town and the people here have no idea that shabby chic, country romantic or romantic homes magazines and books exist! I am never lucky enough to get one of these wonderful magazines in my lil hands unless we travel to the big cities! Lisa, I've given your blog a blog award, check mine when you have a moment. www.maamounmadness.blogspot.com. Thanks for the inspiration! I have been feeling that same slump...just can't seem to get my groove going (and heaven know I need to get it cracking for holiday crafting). Also haven't found any estate sale goodies either. Glad you finally posted...was worried you were still stuck on Hawthorne with your daughter! You have beautiful things!!!! You do a great job of working miracles on these things you find! Would love it if you would add me to the drawing for the magazine giveaway! Those magazines can get so darn pricey! And they are hard to find! Well, happy thrifting to you! Hmmm, this is a magazine that I have not seen! Looks like I need to get me a copy judging by all the positive feedback on it! Please enter me into the drawing! I would love to win this wonderful gift! 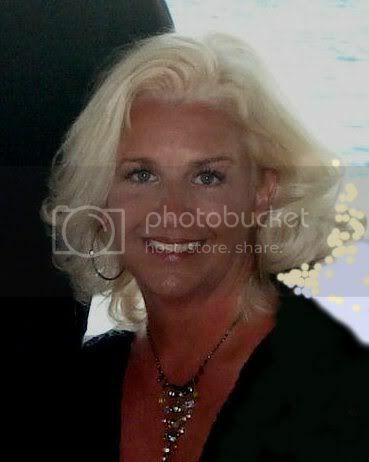 I love your blog...wish I lived nearby so i could go visit you booth! Hope you were able to do your chairs and dress form! Can't wait to see the finished chairs! Also, I 'm glad to know the newest Romantic Country mag is out. My FAV!!!! If I don't win, I know just where to go to buy it. I'm still hunting for Romantic Country. Love the fabrics. Enter me in your giveaway! I have had the hardest time finding this copy. My dear friend Cathy is featured in this issue. Love your flea market finds. Love those shopping carts too. I love your carts! I showed them to my husband and said "I want that" I wish you were nearby! I haven't been able to find this magazine anywhere either! Do they sell out that fast or are they just that tough to find? Hope you had a great weekend and got your projects started. I can't find Romantic Country either and I love it. Also love your blog! I know I'm too late to enter your drawing - but could you tell us at which store you finally found the magazine? I haven't found it yet, either - and just maybe if we have the same store here, I will look there! Thank you.